Hydrocodone and Acetaminophen (brand name Vicodin). On October 6th, hydrocodone containing medications will be re-classified as a Schedule II controlled substance. 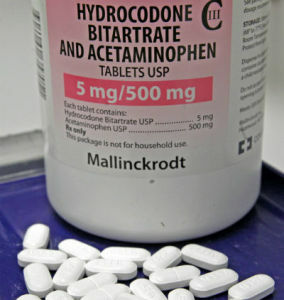 Hydrocodone is a high potency prescription level painkiller included in the combinations known as Vicodin and Lortab. Hydrocodone is considered a narcotic and is classified as an opioid type medication. In addition to relieving pain, hydrocodone can cause drowsiness and has the potential for addiction. Many physicians and dentists, including our Orange, CT dental office, prescribe hydrocodone-containing products to treat pain. As a result, this change affects all dentists and many patients. In the past several years, a new epidemic of prescription drug abuse has emerged, with opioid pain killers being the most frequently abused drug. In fact, on average, narcotic painkillers cause or contribute to approximately 16,000 deaths per year in the U.S. 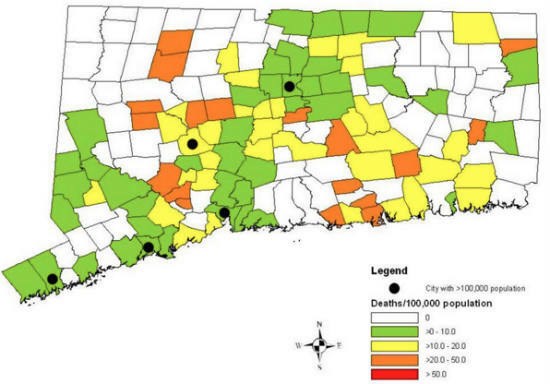 Prescription drug deaths in Connecticut. Fortunately there have been no deaths in Orange. Image courtesy the Connecticut Mirror. In Connecticut, including the greater New Haven area, there has been an average of 272 drug overdoses per year, with many of them from painkillers such as Vicodin. Although there have been no deaths in Orange, our office has seen our fair share of patients who have had abuse problems with these types of medications. In order to combat this epidemic, the DEA is now making it more difficult to obtain hydrocodone containing prescriptions. Some of the changes are listed below. We can no longer call in prescriptions. In general, we can no longer give prescriptions with refills. While this may pose a slight inconvenience to our patients, we hope everyone understands that this is not being done to annoy them but to reduce drug abuse in Connecticut and beyond. 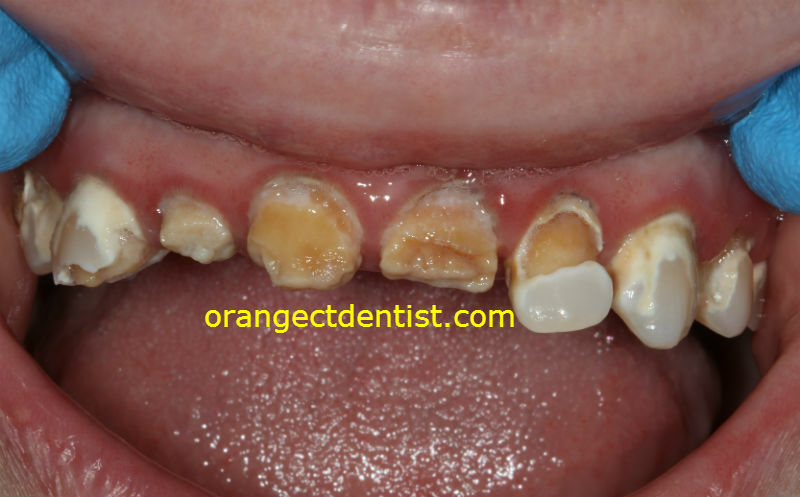 Teeth with untreatable decay due to abuse of Vicodin and Percocet. The only solution is a denture. Photo Dr. Nicholas Calcaterra. We realize that the above photo is graphic and may be disgusting to people. However, it should hit home the point that prescription drug abuse is a serious problem. By adhering to these new regulations, we hope to be part of the solution to our nation’s prescription drug abuse problem.